The Bearing Upon Eugenics of Legislation And Social Customs. All communications should be addressed to the Hon. Secretary, Eugenics Education Society, 6YorkBuildings, Adelphi,London. Eugenics¨ is the study of agencies under social control that may improve or impair the racial qualities of future generations either physically or mentally. It is hoped by the means of this Congress, to make more widely known the results of the investigations of those factors which are making for racial improvement or decay; to discuss to what extent existing knowledge warrants legislative action; and to organize the co-operation of existing societies and workers by the formation of an International Committee or some other means. The subjects of recreations and amusements for the staff of Asylums has always been of the greatest importance in the working of these institutions. Not only do they add to the general contentment and happiness of the staff, but they also promote good feeling among it’s members. This cannot fail to show itself in increased efficiency in the performance of their duties. In another column under the heading of “Staff Recreations¡¨, we publish an interesting account of one of the modern forms of the game of whist. Whist is essentially a game which can be played for it’s own sake, for the intellectual enjoyment which it is capable of affording without any such artificial interest as a money stake. This is an important consideration as far as concerns the average Asylum worker. 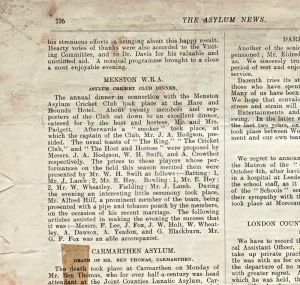 Now that a recreation and amusement column has been commenced, we hope to receive further contributions or suggestions on the subject, and we will be glad to hear what is being done for the staff in these matters in the various Asylums. You would wish for a statutory maximum to be fixed by Parliament with power to the Select Committee to arrange anything they choose? Yes that seems to be a reasonable way of meeting the case. I mean the annual fortnight? yes the annual fortnight. You do not wish to take that into account? I do not; but I think that the day or the day and a half a week which at present is given in London establishments should be taken into account. But supposing Parliament fixed a maximum 70 hours per week and made no provision as to annual leave, might there not be some risk of the annual leave being cut down be the Visiting Committee to compensate? It might be so. And Sunday leave where it is given, would that be counted? No Sunday leave is such an uncertain thing in Asylum service that I think it would have to be treated in the same way as ordinary leave during the week. Then with regard to retirement after 25 years service, the following is the text of Dr Shuttleworth’s evidence. Now Clause 2. In your bill of 1909, as introduced into the House of Commons, what was the proposal: the right accrued at the age of 50 and after 15 years service. That was the original proposition, which was taken from the old Lunacy Act 1890. Do you attach importance to the 25 years? I think in the case of female officers of the Asylum it is important. Not in the case of male attendants? I think it would be very acceptable to the men, but I think it is very much more specially necessary for the women. Have you anything else to say on Clause 2.? In the memorandum I drew up, of which I sent you a copy, I have laid stress upon the fact that it has been suggested by one of our constituent Asylums that the best amendment of sub-section (1) of section 2 of the principal Act would be to retain the present conditions of age and service, and add after the word, ¨old¨ an alternative qualification, or shall have completed 25 years service irrespective of age¨. That would be combining the present enactment with what was proposed. 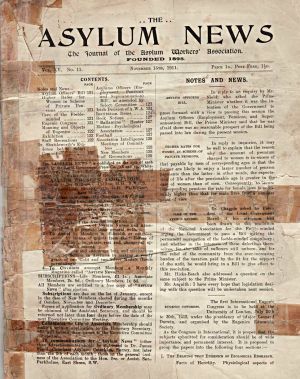 Attention had been drawn by members at several Asylums to the fact that although in the schedule proposed at the meeting of the Select Committee on July 28th a provision appears for ¡§ an allowance in money of a specified amount to be made by the visiting Committee for meals not taken in the Asylum¡¨ no such provision appears in the Bill as amended. 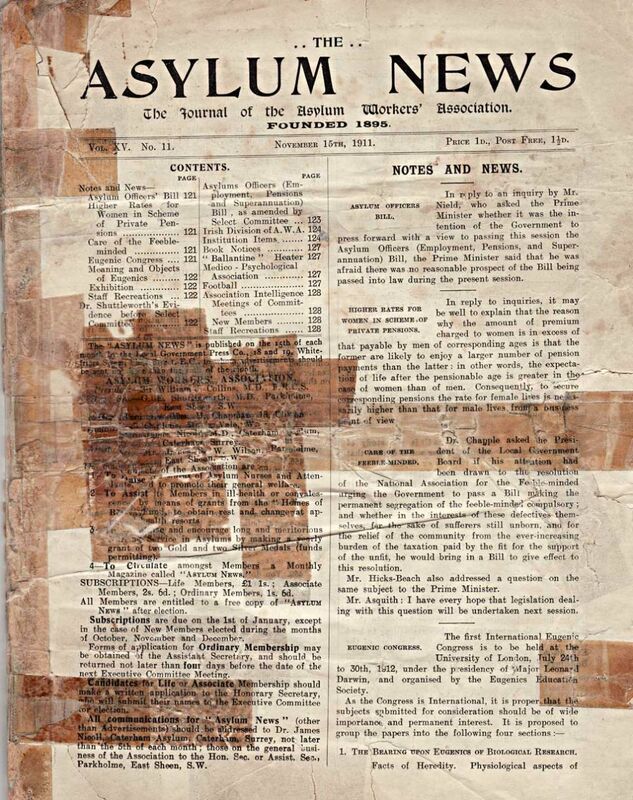 It was pointed out that in consequence of the Bill increasing the amount of leave in order to limit the number of hours of employment hardship would be caused in many cases if there were no provision for money allowances in lieu of rations for those who lived at a distance from the Asylum. It was resolved that the Hon. Secretary be asked to point out the omission to Mr Roberts, MP and to state the reasons for such provision being made. 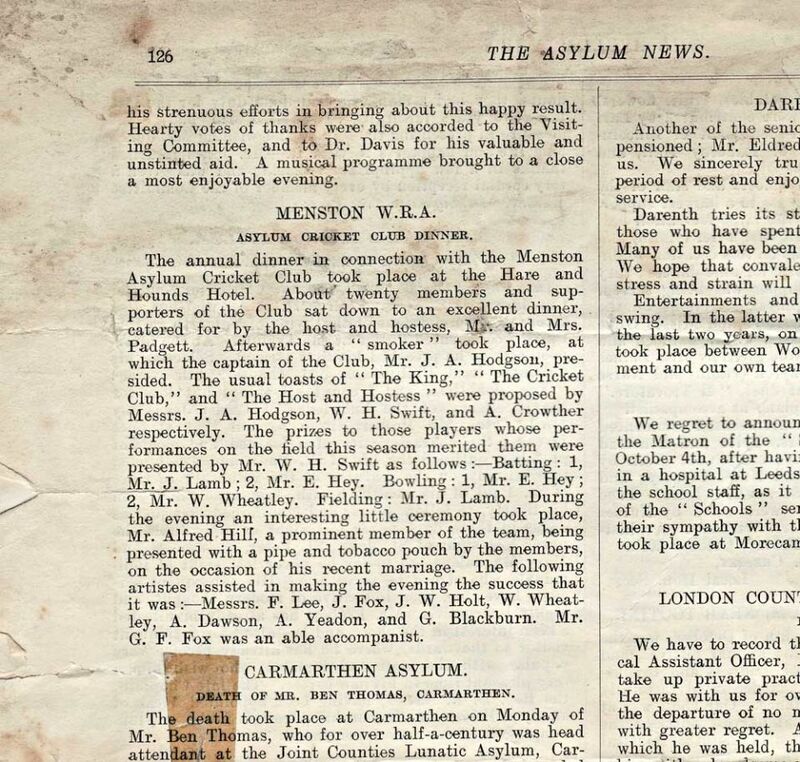 On the suggestion of Mr Morgans it was resolved that it be recommended that the following paragraph be added to the first schedule:- The scheme shall provide for an allowance in money of a specified amount being made by the Visiting Committee in respect of board on whole days spent away from the Asylum¡¨. It was pointed out that the money payment in respect of single meals would be attended with considerable administrative difficulties. From three English Asylums as well as from the Irish Division, representations had been made that owing to the low rate of wages it was highly desirable that first-class pensions should be calculated upon the basis of one fortieth of salaries and emoluments instead of one fiftieth as at present. The Parliamentary Committee, whilst sympathizing with this aspiration, doubted the practicability of obtaining a general concession in this form, but thought that Visiting Committees of Asylums where wages were low might more liberally use existing powers of adding years in computing pensions. We deplore to have to record a very serious accident which befell a member of our Association, Attendant Dan Sullivan, who, whilst in the discharge of his duty, was kicked in the face by a patient and is confined to hospital, but is progressing favourably under the skillful treatment of the medical staff. We sympathize with his wife and family and hope he will soon be able to resume duty. On the evening of November 3rd an interesting presentation took place at the Acute Hospital, when Mr Carley was presented with a beautiful photograph of the members Cricket Club. The photograph, enclosed in an oaken frame, bore the following inscription:- Presented to Mr A.E.Carly as a mark of esteem by the W.R. Asylum Cricket Club. Wakefield, November 3rd, 1911. The Re. D.D. Waters kindly occupied the chair, his references respecting cricket disclosing a keen interest in matters pertaining to the summer game. Mr J. Wilkinson made the presentation, and in a complimentary speech expressed by personal testimony his appreciation of the high qualifications possessed by Mr Carley in captaining the team which position he has held for a period of 34 years. Other speeches in terms of eulogy were given by other members of the club. Mr Carly replied, and in a reminiscent speech gave some details of the progress of the club since the year 1877, concluding by making a suitable acknowledgement of the gift. The Harvest Festival at the Kesteven County Asylum was held on the evening of Tuesday October 10th, when the service was taken by the Rev. Mr Thomas, Curate of Quarrington, who preached from the text, Give us this day our daily bread. There was a very strong choir on this occasion, and the usual musical portion was augmented by lady and gentlemen musicians from Sleaford. The anthum sung was from psalm 126, “The Lord hath done great things,¨ the solo portion being taken by our Matron, Mrs Williams. The church was prettily decorated with corn, vegetables, fruit, flowers, moss, etc. ; some of the flowers were contributed by Earl Brownlow, of Belton, the Lord Lieutenant of Lincolnshire, Major General Willson, of Raucby Hall, and other friends. On Friday, October 13th, the officers and staff of the Asylum treated some of the patients to a harvest supper, dance and free and easy in the large recreation hall (by permission of Dr Ewan). Messrs. Tyler (violin) and Benstead (piano), of Sleaford (who on this occasion volunteered their services, played music for nine dances; they also played selections while supper was being served. Misses Mansfield and Moxon played selections on the piano; Mrs Holmes, Mrs Priestly, and Misses Olive Readman and Pollard, and Messrs. J.H. Baldock and Casbon sang; while recitations were given by Miss Baines and Mr Pyewell. Mr R.J. Layton (violin) and Nurse Fisher (piano) played a musical duet , Il Travatore.¨ Miss Mansfield assisted at the piano as accompanist. Harvest Festival Sunday 8th October, was the day upon which we observed this annual festival, and we believe it was truly a day of gladness and thanksgiving. Our beautiful Chapel was decorated tastefully with fruits and flowers in abundance. Our choir was at it¡¦s best in the singing of special harvest anthems, as well as in leading the congregation in the other musical portions of the services. The anthem in the morning was ¡§Great and Marvellous are Thy Works, and in the evening I will Feed My Flock both being the compositions of Caleb Simper. The evening sermon was preached by the Rev. W.B. Lindesay, M.A. L.L.D., whose lucid, sympathetic and cheering discourse was listened to with close attention and manifest appreciation by the patients, attendants and visitors who formed the congregation. At a meeting of the Asylum Visitors on October 23rd, the Chairman Mr Chadwick formally presented Attendant William Jones, on behalf of the Asylum Workers Association, with a long service medal. The Chairman explained that two medals were given each year by the above named Association for long and meritorious service, and he thought it was not only a credit to the recipient but also to the Asylum that he should have gained this medal. During the 42 years that Mr Jones acted as Attendant at the Asylum, he had not only given satisfaction to the whole of the officers, but also to the patients and latterly, since he had been in charge of the private wards, he had given entire satisfaction to the friends of the patients in these wards. This was saying a great deal for Mr Jones, as the position of an Asylum Attendant was most trying and critical. In spite of the evidence brought forward by the House of Commons that it was difficult to get good Asylum Attendants, they had a man who had done duty for the last forty two years faithfully and well. He had great pleasure in presenting the medal, and wishing Mr Jones long life and happiness to wear it. Mr Jones returned thanks in a few appropriate remarks, and was given a very cordial reception by every member of the Committee present.- Denbighshire Free Press.